So today is “World Nutella Day” according to … someone. That’s the thing with these “food holidays”. Some random person, industry board or group declares a particular day the time to celebrate whatever it is they’re obsessed with or promoting. Some, like this one, are fun while others like, National Apricot Day in January make no sense whatsoever (unless you live the Southern hemisphere I suppose). For World Nutella Day, it appears that two food bloggers got together in 2007 and made a proclamation that February 5th would celebrate all things Nutella. Good enough for me and a great start to my annual February of Chocolate. And by the way, did you know today is also “Chocolate Fondue Day”? Oh yes, it is. According to someone. 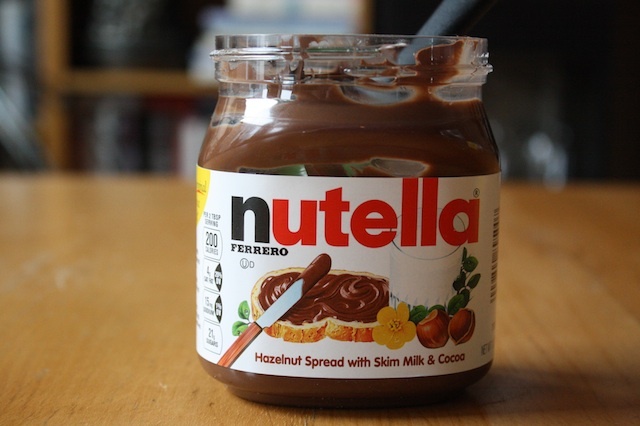 Truth is, I like Nutella but I’m not insanely crazy about it. The combination of hazelnuts and chocolate, known as gianduia in Italy and guanduja in France, is fantastic and an expertly made marjolaine with that beautiful hazelnut praline buttercream and a slick of ganache is one of my favorite pastries. But given the choice, my favorite crepe filling is still just sugar and fresh lemon juice and I have to admit I favor that delicious speculoos spread over nutella. I know. For shame. But there are instances when that combination of hazelnuts and chocolate is spot on. This is one of them. 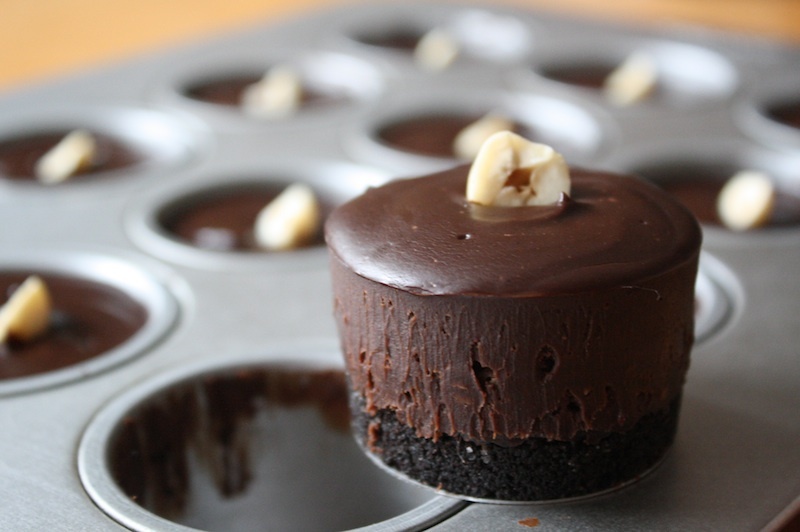 A fairly simple torte with a chocolate cookie crust and filled with a nutella ganache. 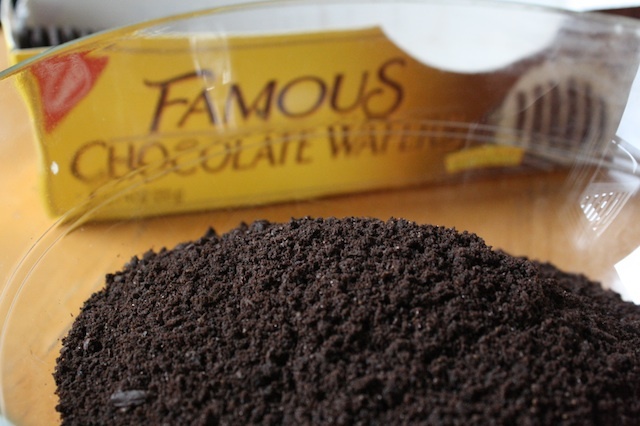 The chocolate cookies I like to use in the crust – “Famous Chocolate Wafers” – are usually found in the cookie section but may be a bit of challenge to track down. If this is the case, use Oreos and omit the sugar in the crust recipe, pulse them in the food processor until fine crumbs, then add the melted butter and proceed as directed. I usually make one large torte but today I decided to make individual. All the better for gifting. STRESS THERAPY BAKING FACTOR: SHARE THE NUTELLA LOVE. A jar evokes cries of happiness like few other things. Chocolate. Hazelnuts. It’s delicious. Some people pretend it’s healthy and eat it for breakfast so indulge that fantasy and make this. You can absolutely serve it for breakfast. Who cares, it’s February and we’re all wrapped up in multiple heavy layers. We don’t have to worry about things like chocolate for breakfast until … oh, maybe May. I’ll think about that later. For the crust: Put oven racks in upper and lower thirds of oven and preheat oven to 350°F. Invert bottom of a 9” springform pan (so that turned-up edge is underneath for easier removal of tart) and fasten the side of pan securely. Place the wafers in a large Ziploc bag and crush with a rolling pin until fine crumbs. In a medium bowl, stir together cookie crumbs, sugar, butter, and pinch of salt, then press onto bottom of springform pan, packing tightly. Bake in lower third of oven 7 minutes, then cool on a wire rack. While crust bakes, toast hazelnuts in a shallow baking pan in upper third of oven, until golden and fragrant, about 7 minutes. 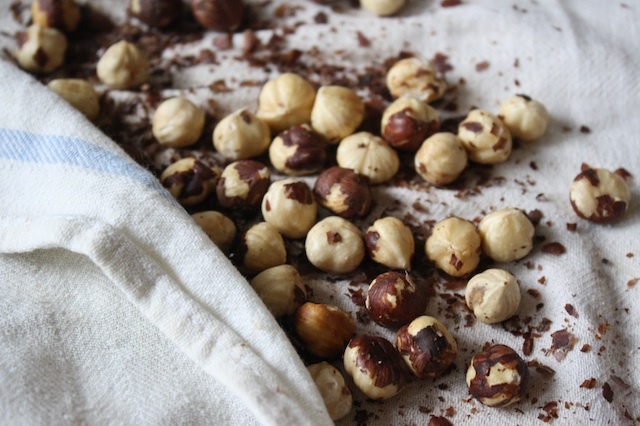 Transfer to a hazelnuts to a towel and cool to room temperature. Rub the hazelnuts vigorously in the towel to remove the skins. Discard the skins and finely chop the nuts; set aside 1-2 Tablespoons for garnish. 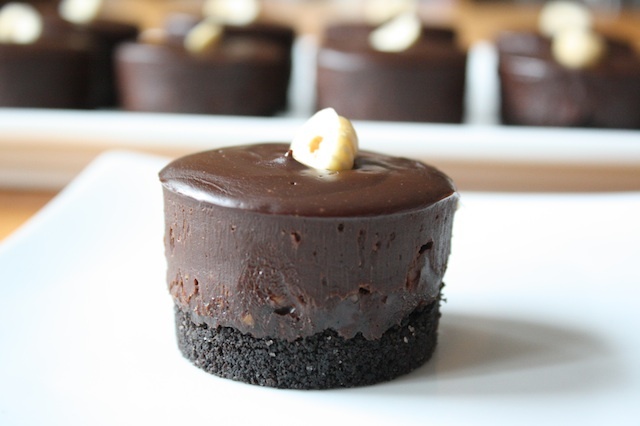 For the filling: place the chopped chocolate in a medium bowl and set aside. Bring cream to a rolling boil in a small saucepan (the same saucepan used to melt the butter), then pour over chocolate. Cover with plastic wrap, give the bowl a shake to submerge the chocolate and let rest 3-4 minutes to melt. Whisk in the nutella until smooth. Divide the mixture evenly between two bowls. Stir the chopped hazelnuts into one bowl with a pinch of salt. Pour the mixture with the chopped hazelnuts into the pan and gently tap the pan to smooth. Place in the freezer for 10 minutes just to set a little. Sprinkle the reserved chopped hazelnuts on top to garnish. Remove the side of the pan; slice with a hot knife, wiping clean between slices. Torte can be made 4 days ahead; store in the refrigerator, covered. Gorgeous. But please tell me – how do you get them out of that pan? The pan has small openings in the bottom of each cavity and a little metal disc. Once chilled, push up on the disc and the suckers pop right out. It’s a dumb pan, as I’ve explained above, but it worked really really well on this one. this looks totally amazing!!! what kind of pan did you use? ?